Square dances are sequence dance for four couples in a square. Each couple faces the centre of the square. 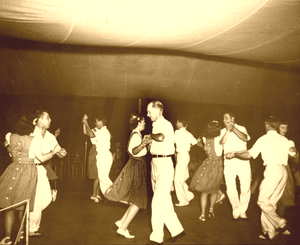 Square dances were first written about in 16th-century England, and were also common in France and throughout Europe. They came to North America with the European settlers. Square dances are a type of folk dance. ↑ Mayo, Margot 1943. The American Square Dance. New York: Sentinel books. This page was last changed on 4 January 2019, at 13:24.